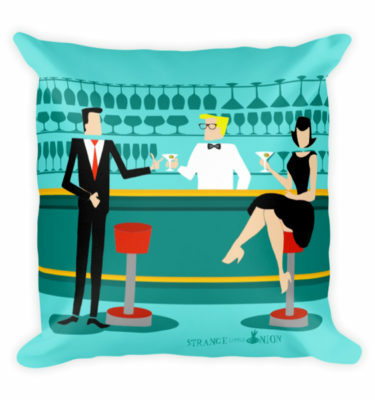 Every hour is happy hour with this Retro Cocktail Lounge. 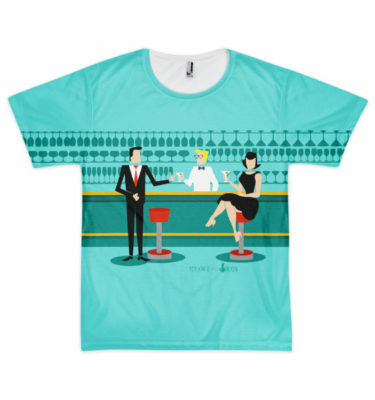 The mid century modern design features a vibrant, 1960’s style, minimalist, cartoon drawing of a classy, cocktail bar. Against the backdrop of an aqua wall, we can see rows of drink glasses. 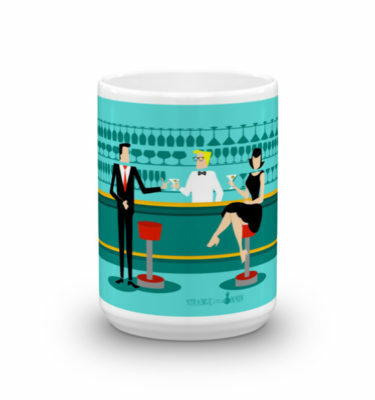 At least we can see the teal silhouettes of drink glasses. 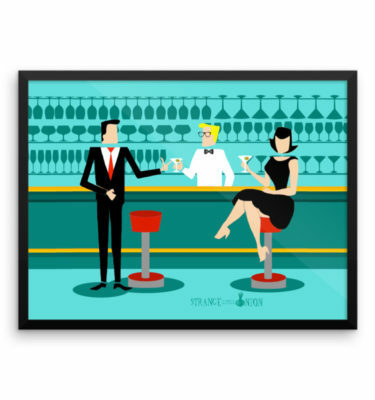 Judging from the shapes of the stemware, this bar is well equipped to wet your whistle, whatever your drink preference. 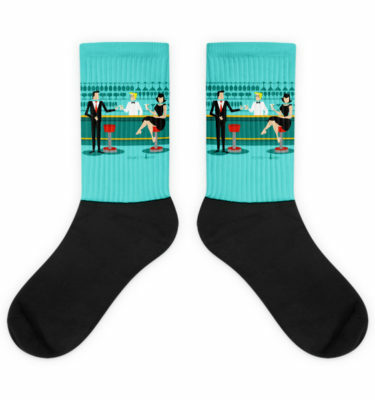 A most competent and personable bartender is manning the teal bar with yellow accents. 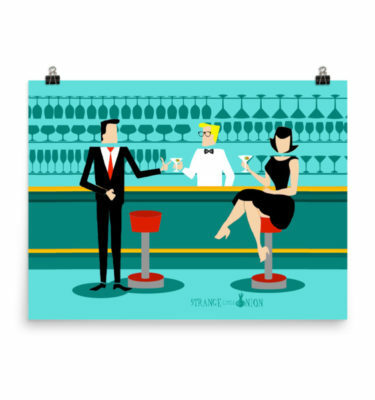 The young barkeep is wearing a pristine, white shirt with black bow tie. His fresh-faced good looks, blond hair and black hipster glasses give us every reason to believe that he either spends his days as a struggling actor or a superhero. 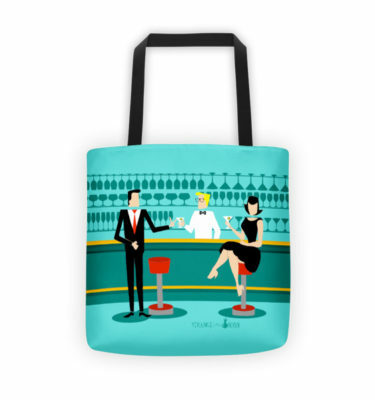 In one hand, the handsome mixologist is handing a martini to a customer on the opposite side of the bar. 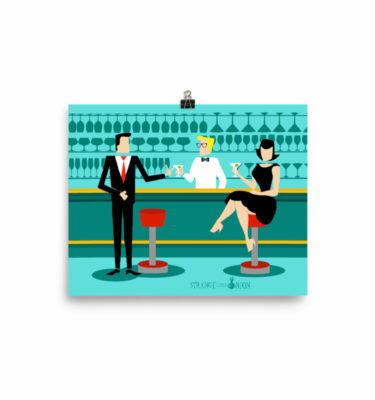 The waiting customer is a broad-shouldered gentleman in a black suit and red tie. He’s the sort of fellow who is described as tall, dark, and handsome even when it’s still hours until closing time. There seems to be a red and chrome bar stool with Mr. Debonair’s name on it. Yet, not to be presumptuous, he asks the question, “Pardon me. 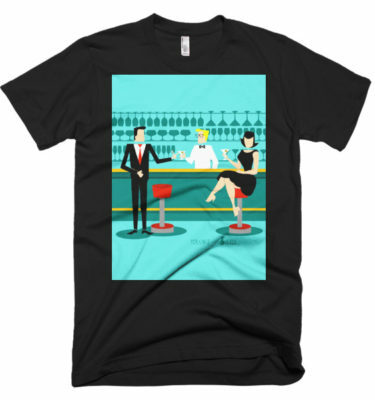 Is this seat taken?” He is asking the raven haired gal on the neighboring bar stool. She’s a real “girl next door” type, if you happen to live next door to a flawless beauty with a figure that won’t quit. 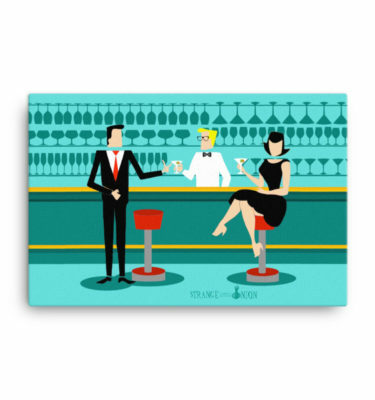 She is wearing a black dress and holding a martini in one hand. 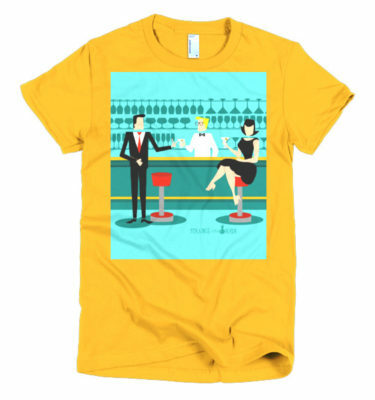 She’s hoping that she and the approaching gentleman have more in common that their drink preference and choice of wardrobe color. It looks like this evening just got interesting. Cheers to you!